This is the second post today, please don't miss out on our special guest star, Jessica Frost-Ballas's post HERE. Hello lovelies! It's Shay here to welcome you to "The Daily Marker 30 Day Coloring Challenge" Blog Hop. Kathy Racoosin from The Daily Marker wants to share her love of coloring with you. 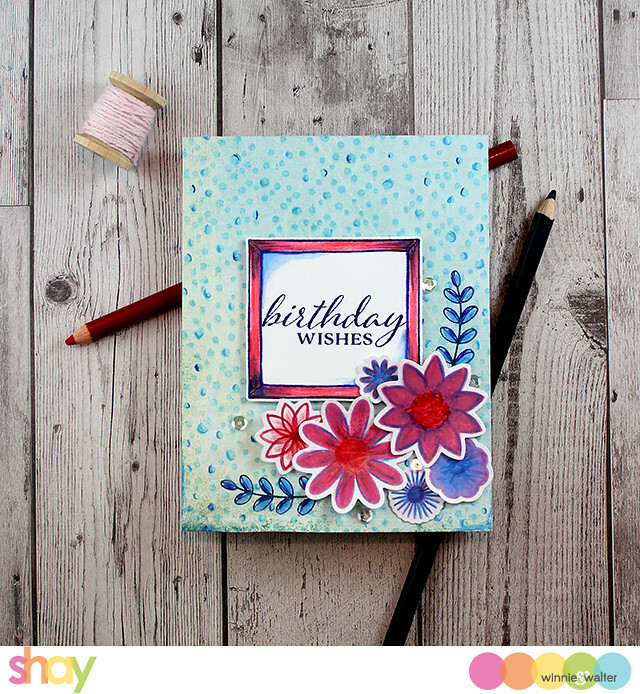 Today Kathy has assembled a blog hop to give your creativity a jump start with some of her favorite stamp companies & Online Card Class partners. (When sharing use #TheDailyMarker30Day so Kathy can find your work). To start at the beginning of the hop go to The Daily Marker. If you are coming from the blog of Paper Smooches you are in the right place. Kathy has the full blog hop list if you encounter a broken link. For today's project I pulled out my Prismacolor colored pencils and sort of went to town. I had a baggie of preciously stamped flowers using In Bloom: Eva's Favorite Flowers already cut out using In Bloom: Eva's Favorite Flowers Cutaways. The funny thing was they were all stamped in a lavender color as they were stamped some time ago to test the coordinating dies. Anyway the moral of the story is that keeping die cut images can come in handy regardless of the color they are originally stamped in. I used the colored pencils and added color using pinks, blues and reds for a palette I know my mom will enjoy (shh, this card is for my mom's upcoming birthday). For the background I stamped a piece of pale aqua patterned paper by Basic Grey (so sad they are gone, but I certainly have a big enough stash of their paper to comfort me) using Hero Arts's Confetti Bold Prints cling stamp in an aqua ink...oh it was so lovely to incorporate another stamp company's stamps with w&w stamps and I do have a love of Hero Arts background stamps among other things. I added a little detail to some of the circles using blue colored pencils. This is very simple way to add some interest and to customize a background. In the right corner I stamped the leaves in navy from Framed with Evelin T Designs and then colored them in. I also stamped the frame from the same stamp set in navy again (I adore navy and it is the perfect neutral for this card) on white cardstock, die cut it out using the coordinating cutaways and colored that in as well along with stamping the sentiment from A Tree for All Seasons. I then arranged the flowers around the leaves and added the frame using foam dimensional adhesive. Last I added some sparkly sequins because well it needed a little shimmer and shine. I hope you have enjoyed my card a little and are inspired to color away this month with Kathy! On this post, please comment and let us know what your favorite coloring medium is (like colored pencils, markers, Distress Inks, etc.). Please include your name and email address in your comment! We will be picking two (2) comments randomly and each winner will receive $25.00 credit to the w&w shop. You have until NOON CST on Saturday, March 11, 2017 to enter to win. The winners will be announced on The Daily Marker Sunday March 12th. Oh and if you are interested in winning every stamp w&w releases in 2017 you have thru next Monday, March 6th to enter HERE. Your next stop on the hop is Power Poppy! Hi Shay, Your Mom will love her birthday card! I save my unused die cuts, too. They come in handy! My favorite coloring tools are my brushes and inks, watercolors, or watercolor pencils. Next I will try the distress inks...I have them but they are still in the package! Thank you for the chance to win! Great card. I love Copics and watercoloring. Watercolors are my current favorite. Your card is gorgeous - it's so much fun seeing the different coloring methods and techniques. Beautiful card. Your mom is going to love it. I really like coloring using Copic markers. Copic markers are my favorite medium to color with ! Watercolors are my favorite. Your color combo is great. Pretty card. Wow! Such adorable card!!! Stunning colors!!! My favorite color medium is Copic markers!!! What a very lovely card!!! My favorite color medium is Copic Markers! Love your background. My favorite medium are watercolors. I really love this pretty card! I like to use watercolours especially zigs. colored pencils and now experimenting with watercolors. Love your card and background - thanks. I love to use markers and zig watercolor brushes. Hope to someday become comfortable with watercolours. What a gorgeous & interesting card, Shay! Love the background--would never have thought to add any coloring! The flowers are amazing! I have lots of options in my stash, but I'm really not comfortable coloring. Need to practice with my Copics as I did have one image turn out pretty good awhile ago. For now, my favorite medium is Zigs wc markers since I can do "messy" coloring & call it artistic--haha! I Love markers of any kind. What a pretty background for your bold flowers! My favorite medium is Copic markers. I use Copics and Zigs mostly. I like to use distress markers the best. Such a beautiful card Shay!! Love the flowers! I love to color with Copics. These stamps are yummy...love my copic markers. I love the bright color on your card! I love to use copics for big, open images, but I also love creating layers of color with colorful inks too. It depends on the stamps and images, really. Thanks for taking part in this challenge! My favorite has always been watercolor pencils whether I use dry or with a water brush. I love having different options. I just started coloring with watercolor pencils. I still love my Copics though. I always seem to go to my Copics for coloring. Beautiful card :) im sure your mum will be very happy receiving it on her birthday. My favourite coloring medium is distress inks. Love markers! The colors on this card work so well! Beautiful card! Such a fun layout and background!!! My favorite coloring medium is Copic markers. My favorite is Copic markers! beautiful project, I love these flower!!! Beautiful card. Love watercolor and colored pencils. WOW, the flowers are so beautiful!!! I love to colour with my GraphIt markers and my coloured pencils - I'm hopeless with watercolouring!!!!! Thanks for a chance/dream to win!!! Awesome card! I am starting to use THoltz Distress Markers to color with. I am intrigued with ZIG watercolor markers videos and think I would like to try them too. Nice card. I love colouring with Copics. 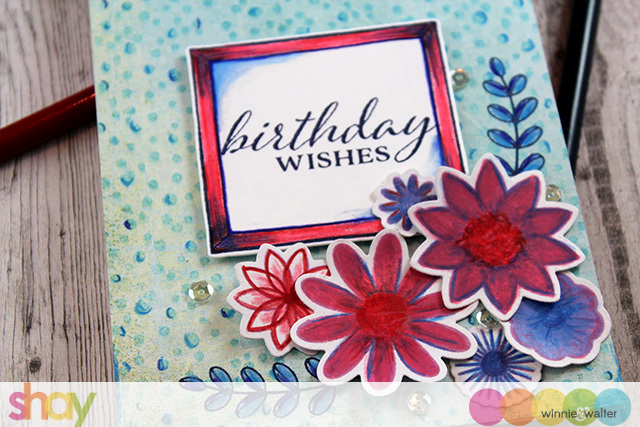 Beautiful card, and so clever to color over the already stamped and die cut pieces! Why didn't I think of that! Your coloring is oh so pretty and I love W&W florals. The HA background is so pretty and your colored pencil detail work ups the wow factor. I just got the 150 Prismacolor pencils and you have inspired me to play with them. (So far, I've just ooohed and ahhhed at them). I really enjoy the loose watercolor coloring but this coloring challenge I want to use my colored pencils more. TFS! I enjoy using markers because of the vibrant colors. Watercolor is what I'm comfortable with, but want to learn others. Thank uou for the opportunity to win. Your card is absolutely amazing, your mom will love it.The coloring is so wonderful and i really love the colors you've used.♥ Many thanks for sharing us your inspiration. I really love to color with my copic marker, i dont miss them. Wonderful card. Love the color choices. What a GREAT card; I love the background, so unique and adds such fun design to the card! GORGEOUS card Shay! LOVE LOVE LOVE the colors you used! Colored pencils are my favorite! Beautiful, such pretty coloring! My favorite is watercolors with my Ziggs! Thanks! I love coloring with alcohol markers!!! Love your cards, so pretty. Zigs and Prismacolor are my favorites! Really like your bold, bright colors. I am loving this challenge, and learning so much. Thanks. I was introduced to Spectrum Noir last July-- fell in love and am learning how to use them one stamp at a time! Beautiful card! The bright colours are fabulous. I enjoy colouring with watercolour pencils most, but would like to try out markers sometime. Beautiful card!! Your mom will love it ❤️ My favorite way to color backgrounds is with distress inks and images with copics. Really cute card! I'm loving watercolor paints right now and the Zig Clean Color real brush markers. Thanks for the inspiration! Wow.. such a beautiful card! Loved it! Thank you so much for this generous giveaway! I love to color with distress paints, these are so versatile and indeed lead to adorable creations! oh, I love that color palette! I prefer prismacolor pencils I think. Cute card. My favorite medium is watercolor using inks, paints, and pencils. My favorite is watercolor pencils. I like zig markers and distress inks but pencils are usually my go to medium. Great idea to have some things precoloured! I love watercolouring my images but to get the most control I use my Copics a lot and for tiny images I use my Prismacolor pencils. I like to use colored pencils and markers. Copics are my FAV medium! i"m on a learning curve with Tombow markers and Inktense markers. Not sure which is my fave yet. My favorite is my alcohol markers. I am hoping to get comfortable with my Zig watercolor markers though. I am a beginner when it comes to coloring stamped images but my usual method is dye markers. Learning how to use alcohol markers is on my to-do list, because it always looks amazing. Your card is beautiful and I really like the extra detail on the background. What a beautiful card with bright colors! I'm used to Copics but trying to branch out and get better at colored pencil and water coloring! I love copics, but recently I got some Gel pens that are fun to use! Love my Copics first and coloured pencils are a close second. Beautiful card! Thanks for the giveaways and inspiration! Fav medium are alcohol markers. Copics, but i'm still learning! Bright & Beautiful card. I'm loving colored pencils right now! Thanks for sharing. I love the in bloom stamp set. Beautiful card! I love watercolors and Copic markers! Great card! Love the tip of coloring over stamped die cuts! My favorite coloring mediums are copics and zig clean color real brush markers. My favorite way to color is with alcohol markers. Lovely card! Lately its been my Zig clean color markers but I always go back to my Prismacolor pencils!! I feel like Copics are somehow quickest for me, even though I am not very skilled with them still. Oooooh! Super swoonworthy card! Your treatment on the background adds so much dimension and texture and the blooms are beautifully vibrant. My favourite way to colour is with colouring pencils (only have a single white prismacolour but so would love more of those!). email is sharontraynor at outlook dot com and my name is Sharon Traynor. I am in love with this card! So sweet and fresh and pretty! Your mom will love it :) My favorite coloring medium is watercolor right now, but I hope to get better at my Zigs! Such a cute card! I have to say I really miss Basic Grey too. Color pencils are my favorite but it's going to be fun trying new things. I have so many coloring tools that I enjoy. I guess I use my zig markers the most but really love watercolor pencils too. Such a pretty and Spring-like birthday card. I do love my Copics! I love to color with my prismacolor pencils! I love your bright flowers! Pretty card and colors! I love my Copics! My favourite colouring medium has to be watercolours although I really want to take some classes to increase my skill level with paints and copics. Really bright and beautiful colors. This blog is so much fun! Beautiful card. I love all kinds of water color mediums. I love to color with my copics! I am also very fond of my colored pencils! Fabulous card/coloring!! I enjoy coloring w/copics! Lovely card. I love using watercolors. I love the bold, mixed media feel of this card! really lovely way to mix companies. I love to color using Alcohol Markers & Distress Inks. Thank you for the chance to win, I don't yet own any W&W products, but I certainly want to!!! I use watercolor pencils. Such a pretty card. Thank you for the chance to win. Great card! I love the pencils over colored paper. My favorite medium is watercolors (from tubes). I love this card! Especially what you did adding bits of accents on the background - I never would have thought to do that! My current favorite medium is my new color pencils - I'm sure that'll change once my fascination wanes a bit, but at the moment ... Thanks for your generosity! I love copics and water color. I love the background on your card! I love my Spectrum Noir markers. Love Spectrum noir and watercolors. Very pretty card - great background! I love to water color with distress inks. My favorite coloring medium is alcohol markers! Like the background a lot & the brightly coloured flowers. My favourite medium is Distress Inks with water. WOW! I love your color choices and the frame looks like it is shining from within!! Beautiful! I love my copic markers and also my Stampin’ Up markers to do my coloring. Thanks for the giveaway. Love the use of navy...I never think about navy -- but you can bet I will now! First choice is colored pencils -- kind of old school that way. Second in line are watercolors...but pencils will always have my heart. At least for today!! Thanks for sharing your ideas and talents with all of us. It's been a fun way to spend the afternoon!! love the navy and the red. don't see a lot of navy on flowers but i love it. I love watercolors and pencils and am trying to incorporate water in both Love spending my afternoons making cards. Copics! They make me feel like I can color, LOL! Wonderful card for your mom. I like the detail added with colored pencil and the framed sentiment. I like to use markers to color. Love your card, I got 132 prizmacolor soft core pencils and zig clean color pens for Christmas. I've been hsving a great time trying new ways to color. My favorite however is watercoloring. Right now I use colored pencils. I love your card! Alcohol markers are my favs. Thanks for the post, and the great hope. I love this challenge! Copic markers are my most used coloring medium. Beautiful card. Oh WOW!! The background is lovely but I ADORE the flowers you colored with the pencils. So rich!! Right now colored pencils are my favorite but I can't wait to be able to get and try alcohol markers. Great card! Love the background against those bold flowers! I love to practice using water colors or pencils! I love your colorful card! I love distress inks to color with. I jump around all the time. watercolor,zigs, spectrum noir. trying pencils now. Wow, these are so unique and lovely. Lovely card - but I'm biased because red is my fav colour! My favourite colouring medium is coloured pencils. Oh, so pretty! Love the color combo! My favorite medium is markers (Spectrum Noirs). My favorite medium are markers. Very pretty card and coloring. Love the colors. My favorite color tools are copies. I have been using color pencils a little for certain areas of the images. This is new to me. For backgrounds I like Ranger inks and smoothing. Kuretake gansai paints are a favorite for background.. Bright and bold. Love it. I love to color with markers the most. I like to color with copics. I mostly color with copics, but I love to watercolor too. I save my bits and pieces.... some colored, some not...., and usually find a use for them. Your card is beautiful and a perfect example of why we should do this. I love watercolors best, including pencils, water-based markers, crayons....you get the idea. Fun blog hop and thanks Kathy! I really enjoy my Copics. But I'm looking forward to exploring pencils. My favorite are the spectrum noir markers. I love my Zigs, they make me look like a better "colorer". I am anxious to use the new Distress Oxide Inks. I love this floral stamp. I love my zig markers. Pretty card! Love using my Copics and distress inks!! My last project was with watercolor, my next will be with Gouache. I love all color delivery systems. Love the card, and my favorite coloring medium is markers, specifically water color markers! Lovely design! I think colored pencils are becoming my go to coloring medium but all honesty most of the time I go with the flow or feel of each project, thanks for sharing! I love Watercoloring with Marvy pens! Wonderful bold colors...make me want to watercolor with my Distress inks! Beautiful card, lovely color combo! My favorite medium is copic markers, I have such fun coloring with them. My favorite medium, at least at the moment, is alcohol markers, especially but not limited to my copics.